large mooring Archivos - Puerto Deportivo de Gijón, Asturias. Norte de España. 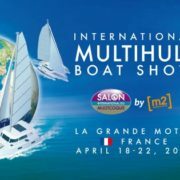 A representative of Gijón marina visited the Multihull Boat Show that took place the last 18th to 22nd of April in La Grande Motte, France. All the catamaran constructor companies as well as engine and sail builders met at this unique and emblematic multihull (catamarans and trimarans) event. At La Grande Motte marina, we could enjoy the largest catamaran show, with more than 60 participants. The purpose of this visit was to meet the catamaran constructors in order to strengthen the stop in Gijón of catamarans departing from La Rochelle, Les Sables d’Olonne, etc. in the Atlantic Coast, where the main shipyards of France are located. The increase in sales of this type of boats, that requires large moorings, can find in our marina the ideal place, not only for technical stops but also for customers who already have this kind of vessels and also because of our geographical situation and the proximity to the city centre, both reasons making Gijón marina a reference marina in the Bay of Biscay.